This is Ross Marchant and he presents Music Mania on Thursday nights. Ross has had a keen interest in radio for as long as he can remember. Ross has been involved with a number of radio stations across the west. He has worked at the former local radio station Orchard FM where he produced and presented nightly music reviews of new releases. Ross also worked with Orchard’s promotional crew and presented a handful of shows on the station. He has also worked at GCAP’s head-office in Bristol (the company that owned Orchard and other local stations across the country). He was given a number of jobs including hitting the streets of Bristol to record vox-pops amongst other tasks. 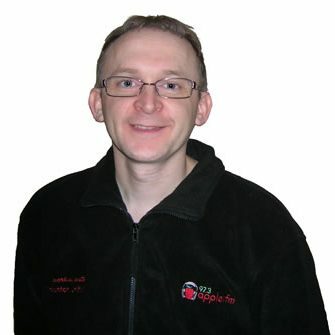 Ross is on Apple FM’s Board of Directors and is also the Programme Controller for the station, responsible for overseeing all of the stations output. Join Ross on Thursday evenings between 8pm – 10pm.